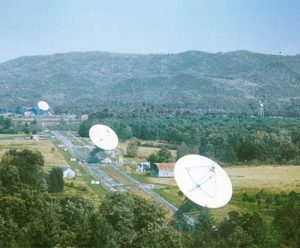 These three identical 85-foot dish antennas worked together as the Green Bank Interferometer, a testbed for the VLA. Two of the antennas can be hauled to different locations along the road linking them. 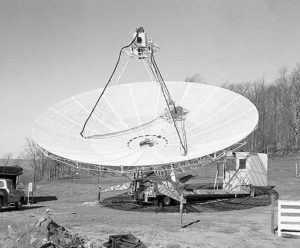 The 85-2, our second 85-foot antenna in Green Bank, was equipped with a trailer on each of its four legs so that we could haul it closer or farther away from the stationary Tatel. 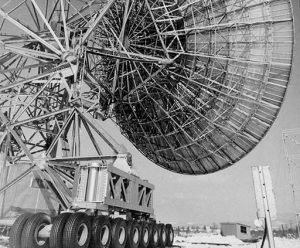 To improve our testing for what would become the Very Large Array, the GBI used a series of smaller, portable telescopes on remote mountaintops. This was our 42-foot antenna that ran off the back of its trailer.